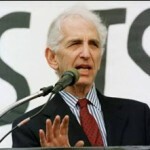 This week, a repeat of Dr. Caldicott’s September 2010 interview with Daniel Ellsberg. In 1959, Ellsberg became a strategic analyst at the RAND Corporation. He was also a consultant to the Defense Department and the White House, specializing in problems of the command and control of nuclear weapons, nuclear war plans, and crisis decision-making. On return to the RAND Corporation in 1967, Ellsberg worked on the top secret McNamara study of U.S. Decision-making in Vietnam, 1945-68, which later came to be known as the Pentagon Papers. In 1971, he gave the Papers to the New York Times, the Washington Post and 17 other newspapers. His trial, on twelve felony counts posing a possible sentence of 115 years, was dismissed in 1973 on grounds of governmental misconduct against him, which led to the convictions of several White House aides and figured in the impeachment proceedings against President Nixon. Ellsberg was the subject of the Academy Award-nominated 2009 documentary, The Most Dangerous Man in America. In this interview with Dr. Caldicott, Ellsberg touches on WikiLeaks, the continuing high risk of nuclear war, the threat of a U.S. war on Iran, nuclear winter, and how to read the Obama administration. Ellsberg starts off praising U.S. soldier Bradley Manning, who has released 90,000 classified documents about the U.S. war in Iraq through the whistleblower Web site WikiLeaks. Read the January 22, 2011 article, Lawyers Condemn ‘Abuse’ of Suspected WikiLeaker Bradley Manning. Subsequent to this interview, WikiLeaks announced it would release 400,000 documents about the war. Watch the October 22, 2010 interview with Ellsberg on Democracy Now, in which he talked about the forthcoming leaks. Ellsberg describes his work as an analyst at the RAND Corporation, which by the 1950s was involved in nuclear-war planning. He provides some fascinating background on the perceptions about the Soviet Union that motivated U.S. weapons making, and the possibility even in 1960 that the U.S. and Russia could cause nuclear winter. The conversation touches on Robert McNamara, someone known by both Ellsberg and Dr. Caldicott. They express differing viewpoints about McNamara’s motivations and his sense of morality. Dr. Caldicott mentions something startling McNamara told her about the Cuban Missile Crisis. in government and military organizations who fear ostracism for speaking out. The Crimes of Obedience, which he calls “disconcerting.” Ellsberg and Dr. Caldicott talk more about McNamara, the subject of the documentary film The Fog of War. She asks Ellberg if Ellsberg know about the U.S. plans to use nuclear weapons on Vietnam, and also for his analysis of Henry Kissinger. Ellsberg reveals the chain of events that almost led to the nuclear bombing of Vietnam in the 1960s. Dr. Caldicott shifts to the present, and asks Ellsberg to discuss the nuclear posture and arms control prospects under President Obama. In his comments, Ellsberg points to the disconnect between Obama’s speeches and his actions, Obama’s alarming actions in the arena of war-marking and civil liberties, and his disappointingly weak nuclear disarmament initiatives. Dr. Caldicott asks for Ellsberg’s assessment of the risk of nuclear war in the next 10 years. He gives some scenarios that could trigger a nuclear exchange, and says that preventing nuclear war “deserves the highest human priority.” One of the issues he raises is the likelihood that a more limited nuclear exchange between India and Pakistan would seriously damage the ozone layer and have a terrible effect on global climate. Listen to Dr. Caldicott’s interview with nuclear-winter expert Dr. Alan Robock, who has studied the effects of full-scale and limited nuclear war. Read India-Pakistan Nuclear War Would Kill Over Billion People. Read the Web page The Consequences of Nuclear Conflict between India and Pakistan. One of the critical points Ellberg raises is the unfounded confidence of many world leaders that a nuclear war could be “limited.” For more information, visit Ellsberg’s Web site, his Facebook page and the Facebook page for The Most Dangerous Man in America. Listen to Dr. Caldicott’s 2005 interview with Ellsberg. Read the August 1, 2010 Washington Post article Daniel Ellsberg’s WiliLeaks Wish list.